Nothing fancy here, no chips or resistor arrays. The only interesting thing is that it uses combinations of direction presses for Select and Run. Up and Down for Select, Left and Right for Run. It uses a couple of diodes for this - their value isn't really important so don't let it worry you. This pad uses a pinout similar to many others. 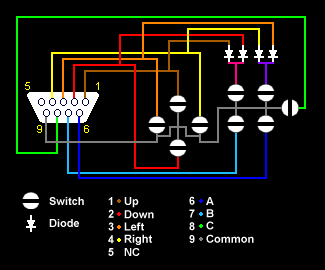 There is a comparison of MSX, Sega, Atari and other connectors on this page. Tiny numbers can be found on most DB9 connectors; they're small but they're there. Be careful not to wire things backwards!